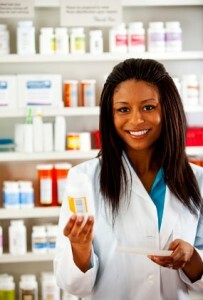 Become Career » How Do You Become a Pharmacist? For students seeking to join the booming healthcare industry in a career that integrates medicine with chemistry, choosing to become a pharmacist can be a great move. As the large baby boomer population continues to age and rates of chronic medical conditions soar, there is expected to be a rising demand for more prescription medications. Therefore, more pharmacists will be needed to ensure medications are dispensed accurately and patients understand how to use their prescriptions safely. In fact, the Bureau of Labor Statistics estimates that the employment of pharmacists will rise at the fast rate of 14%, thus creating 41,400 new jobs in America by 2022. If you are ready to start the academic journey towards joining this growing healthcare field, read on to find a step-by-step guide on how to become a pharmacist. After receiving a high school diploma, the first step is to enroll in an accredited four-year higher learning institution to complete at least two years of pre-pharmacy coursework at the undergraduate level. In order to avoid having to complete a full bachelor’s degree, it is advised that you find a university or college that offers a pre-pharmacy program. In the two years of undergraduate studies, you will build a solid foundation in human anatomy, biology, calculus, statistics, chemistry, physiology, and physics. Once you fulfill the specific course requirements needed for your pharmacy school of choice, you will need to take the Pharmacy College Admission Test (PCAT). Prepare for the exam by studying the PCAT handbook or taking a preparatory class to ensure you have the scientific knowledge to pass. Next on the track towards becoming a pharmacist, you will be required to earn the professional post-graduate Doctor of Pharmacy (Pharm.D.) degree. At this time, there are 124 Pharm.D. degree programs throughout the United States that have been fully accredited for excellence by the Accreditation Council for Pharmacy Education (ACPE) to choose from. Most Pharm.D. programs will take four years to complete all advanced graduate studies related to chemistry, pharmacology, pharmacognosy, business management, pharmacy practice, medical ethics, mathematics, nutrition, and microbiology. All accredited Pharm.D. programs will also require you to complete supervised clinical internships to obtain valuable work experience in hospitals, retail pharmacies, clinics, grocery stores, and other general merchandise stores. Regardless of your state of residence, the final step towards becoming a pharmacist is to receive a license to legally begin practicing pharmacy. Aspiring pharmacists are required in all states to earn a passing score on the North American Pharmacist Licensure Exam (NAPLEX) to demonstrate pharmacy skills and the Multi-State Pharmacy Jurisprudence Exam (MPJE) to show knowledge of national pharmacy laws. In order to expand professional credentials, you may also want to receive board certification through the Board of Pharmacy Specialists (BPS) in the areas of Ambulatory Care, Critical Care, Nuclear, Nutrition Support, Oncology, Pediatric, or Psychiatric Pharmacy. Overall, pharmacists are highly trained healthcare professionals who use their specialized expertise in chemical sciences to oversee the safe use of prescriptions, provide immunizations, conduct health screenings, and offer advice on healthy lifestyle choices. Although it typically takes between six to eight years of schooling to become a pharmacist, the hard work pays off with a lucrative average annual salary of $116,670 and the emotional rewards of playing a major role in the distribution of pharmaceutical drugs.